On top of stealing borrowing Micol's clothes and accessories whenever I get a chance, I also love going over to her place and raiding her jewelry stash. While I have a ton of chains, beaded necklaces and other adornments that I've picked up from vintage stores and various travels, Micol's collection is full of quirky, standout statement necklaces--like this one she picked up recently from none other than Alter (also featured here and here). I usually shy away from wearing large, heavy necklaces like this... if not for fear of looking like I tried too hard, at the very least because of the fear of accidentally breaking them. Miraculously, I think neither one of my two fears came true while sporting this outfit, which is due in part to the jean vest that brings the intensity of the necklace down a notch. Micol and I just created the vest by lopping off the arms of a 10-year old Earl Jean jacket I had in my closet, and it might just be one of my favorite new clothing items for summer. DIY at it's easiest! To die for necklace! Has a shattered glass effect paired with the denim vest/maxi combo...eyecatching! That necklace is so cool!!! I love it. It's like a piece of art. I also love the denim vest. I really need to get my hands on a denim jacket. love the pictures soo pretty. i love your dress and necklace! These photos are so amazing that I literally feel like I can touch the denim vest from my computer screen! Similarly to you, I don't wear such large statement necklaces due to my fear of it snagging the fabric...yes I am crazy! And on your comment, I don't use exactly the same filters, but I mostly use "Rise", "Sierra", "Lo-Fi", and "Hudson"! Dude - That necklace is FIERCE!!! I LOVE IT! This is such a great look, and I love me a good denim vest! I snipped the arms off of a denim jacket that I hadn't worn in years and have been looking forward to rocking it as a vest sometime soon! love the denim vest and maxi combination!! You look fantastic! I love that maxi! Marcy, I totally adore this outfit, it looks smashing on you! 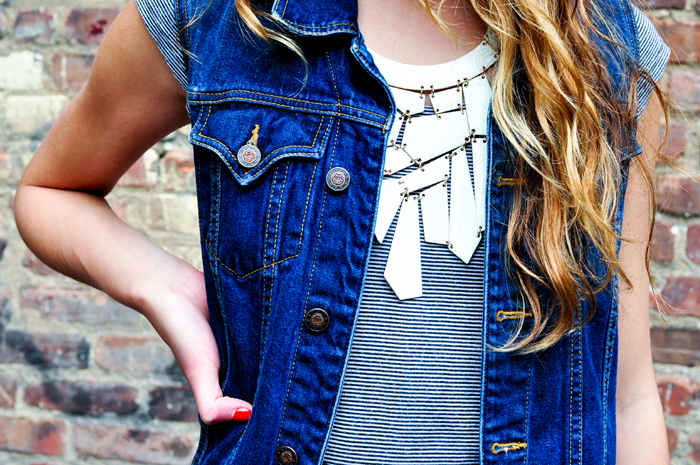 That maxi dress, that statement necklace and the great sleeveles denim jacket, just perfect! LOVING the maxi and that necklace!! You have wonderful blog and pictures!! I adore your denim jacket! Fabulous style. Cool necklace! It adds some funk to your outfit.